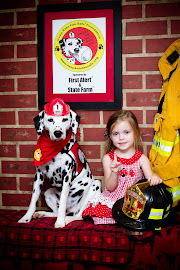 Fire Safety Rocks: Let's Celebrate Sparkles the Fire Safety Dog being featured in Cesar's Way Magazine! 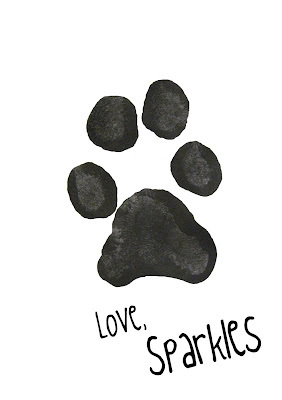 Let's Celebrate Sparkles the Fire Safety Dog being featured in Cesar's Way Magazine! I am one lucky dog! 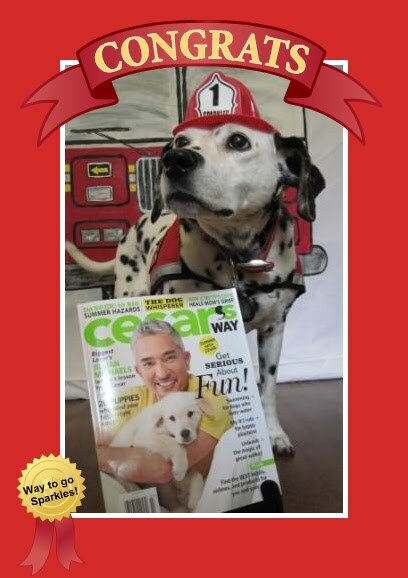 Thanks so Cesar Millan, an article about my journey to become a fire safety dog, as well as valuable fire safety tips to help keep you and your family safe, are in the July 2010 issue of Cesar's Way Magazine. Take a picture of your four-legged friend or child with the cover of the July issue of Cesar's Way Magazine (or the article about Sparkles the Fire Safety Dog) and your name will go into a drawing to win some very special items to help keep you and your family safe! A random drawing will be held to select one winner who will receive one of the very first copies of the revision of Sparkles' children's fire safety book, Sparkles the Fire Safety Dog, due to be released in July! 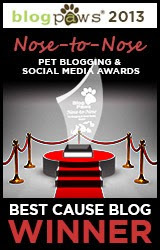 The book will be autographed by Children's Author Firefighter Dayna Hilton and "pawtographed" by Sparkles the Fire Safety Dog! The winner will a lso receive a Talking Combination Smoke and Carbon Monoxide Alarm from our good friends at First Alert! Woof! 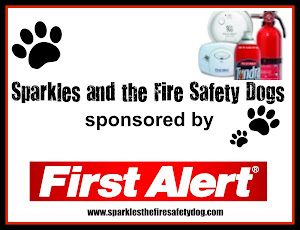 Send your photo to me, Sparkles, along with the name of your four-legged friend(s) to sparkles@sparklesthefiresafetydog.com (include "Cesar's Way Magazine" in the subject line) or upload your photo on Sparkles the Fire Safety Dog's Facebook page. One entry per person. All countries welcome! I love my friends from all across the world! Drawing to be held June 31, 2010. Good luck and stay safe my friends! 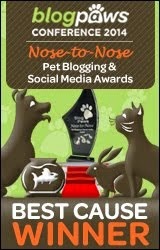 This contest not affiliated with Cesar's Way. Learning about fire safety can be fun when you learn it with the Fire Safety Dogs! Tango, Siren and Molly are not only members of their local fire department, but mascots for the Keep Kids Fire Safe Foundation. They love helping keep children and their caregiver’s fire safe! According to a report from FEMA's Topical Fire Report Series (Volume 11, Issue 9 / February 2011), children age 4 and younger, are those least able to make their way to safety without help and account for roughly half of all childhood deaths and injuries suffered in fires. In addition, the report states that children younger than 5 made up 52% of the deaths of children younger than 16 in fires in 2007 and comprised of 46% of the injuries that year. We are dedicated to helping reduce fire related deaths and injuries among children by providing fun, educationally sound programming. 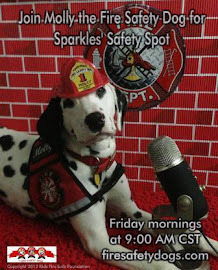 Lola Belle to Interview Sparkles! Firefighter Dayna is Learning to Draw! Skype FREE with the Fire Safety Dogs! 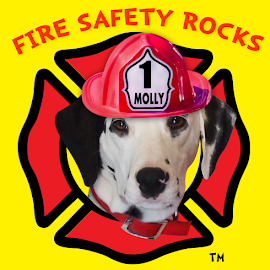 Listen to a special message from Molly the Fire Safety Dog! ©2013 Keep Kids Fire Safe Foundation. Simple theme. Powered by Blogger.